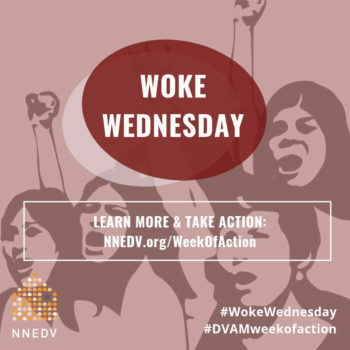 Join NNEDV October 14 through 20, 2018 for the National Week of Action! Tell us how YOU are getting involved during the National Week of Action using #Safety4Survivors and #1Thing. Connect with your territory/state coalition. 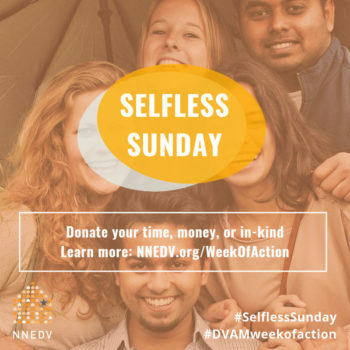 Donate to NNEDV. Support our life-changing work. Here are other ways to get involved. Write a letter to the editor – use our template guidelines or check out this example Letter to the Editor. Use our talking points to start conversations about domestic violence with friends, family members, neighbors, or colleagues. Challenge myths about domestic violence. Here are 31 ways you can challenge widely-held perceptions about domestic violence. Check out this year’s partners on Twitter. 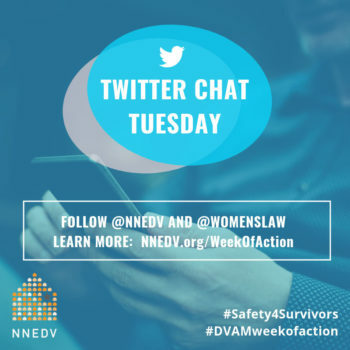 See highlights from the 2017 #Safety4Survivors Twitter Chat in English and Spanish. 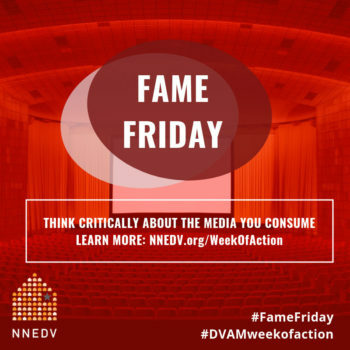 Sign up to receive NNEDV’s occasional Action Alerts and updates. First-time voter? Here are some tips. Engage with candidates. Ask them questions about how they will support survivors. 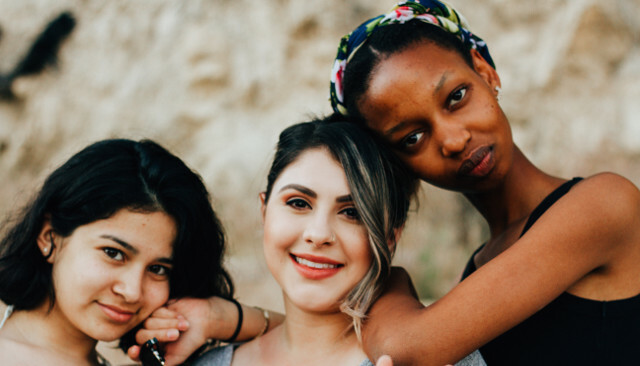 Check out these customizable resources developed by the California Partnership to End Domestic Violence. Sign up to show your support on Facebook. See some pop culture commentary that can help you think critically about the popular culture we consume. Host a movie night (check out our Pinterest board for movie ideas!) and use our Movie Night Conversation Guide to talk about the themes from the film. Learn about our online book club, Reader with a Cause! 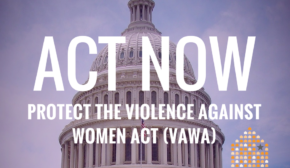 Join today to participate in discussions about the ways in which popular books address domestic violence, sexual assault, stalking, and dating violence. Our #EmpowermentPlaylist collects inspirational songs that inspire us to fight for change, offer strength, and empower. 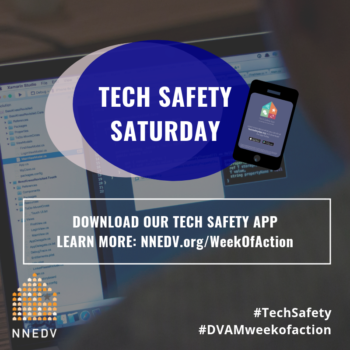 Download our Tech Safety App (now also available in Spanish | Ahora disponible en español). Update your privacy setting on social media – we have handy guides on privacy and safety on Facebook. The Internet of Things (IoT) refers to internet-connected devices that are able to connect with other devices and to be controlled remotely through a device or app. Check out this series of handouts describing the risks and potential benefits of the new wave of IoT devices. 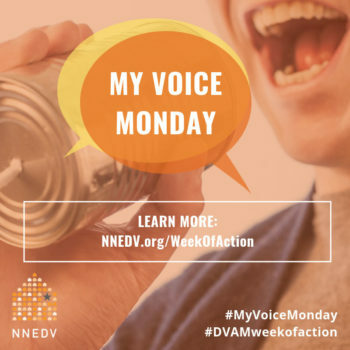 See what DVAM events are happening in your community by visiting your territory/state coalition or checking out the national calendar of DVAM events! Organizing an event? 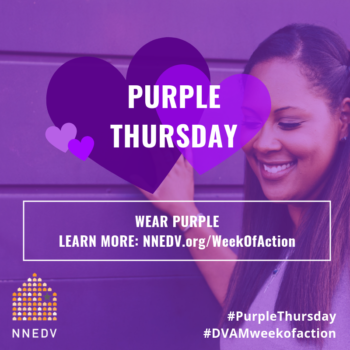 Visit the National Resource Center on Domestic Violence for other DVAM materials! Download the #1 Thing Action Guide: Inspiring Action Through a Unified Message for templates, recommendations, strategies, and tools for incorporating the #1Thing message into public awareness activities and campaigns.